Azerbaijan cannot take as Russia's position the words of Konstantin Zatulin, the Deputy Chairman of the Committee on CIS Affairs, Eurasian Integration and Relations with Compatriots of the Lower House of Russian Parliament, the Member of Azerbaijani Parliament Chingiz Ganizadeh said Oct. 5 at a plenary session of the Parliament, commenting on Zatulin’s latest aggressive statements against Azerbaijan. Ganizade noted that demonstration of such a position by the deputy chairman of the committee of the Lower House of the Russian Parliament is unacceptable. "Naturally, we cannot accept his words as Russia's position. Zatulin argues that if war breaks out in Nagorno-Karabakh, this could lead to the collapse of Azerbaijan. He also claims that Azerbaijan’s policy does not correspond to what is reflected in the bilateral documents," the Azerbaijani MP said. He said Zatulin, by drawing on someone's personal opinion, is trying to present it as a policy of Azerbaijan. "Naturally, we strongly condemn it," Ganizade said. 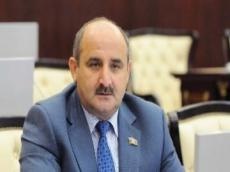 The Azerbaijani MP also spoke about the relations of Zatulin with the Armenians. "Zatulin took part in the "parliamentary election" of the separatist regime established in the occupied territories of Azerbaijan, and this person was included in the list of undesirable persons of the Ministry of Foreign Affairs of Azerbaijan," the Azerbaijani MP said.